Micayla Meehan grabs a pass during a game earlier this season. That impressive play has them in prime position to erase the struggles from early in the season and finish the season with double-digit wins for just the second time in the past six years. On Tuesday, Feb. 5, the Indians once again played strong defense, and generated enough points to come away with a 35-27 win over host Delmar. Senior Julia Jordan led IR with 11 points, and also contributed six blocks on the defensive side of the court. Freshman Le’Anya Garrison chipped in with nine, while Micayla Meehan (seven points), Yonya Wise (six points) and Savannah O’Shields (two points) also figured into the offensive effort. “We switched to a man defense in the second half, and it helped pick up our energy,” head coach Paul Weisengoff said after the game. “Lauren [Meehan] locked down [Delmar’s] three-point threat, but it truly was a team effort. 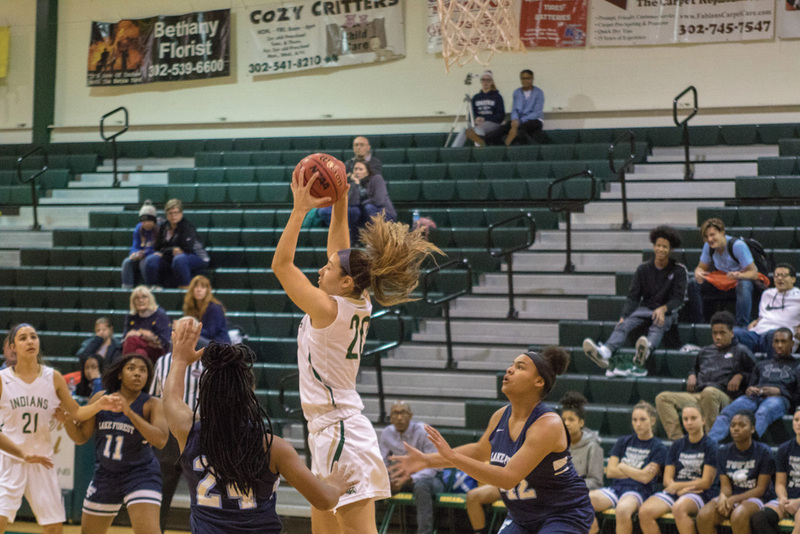 Wise has certainly started to come into her own since the holiday break, and Weisengoff was quick to praise the junior, as well as sophomore Lauren Meehan. “Yonya Wise has really come on strong the last few weeks,” Weisengoff said. “She always has a tough defensive assignment and has become a scorer for us. The win brings the IR girls’ team’s record to 8-10 on the season, with the two games remaining. They were set to host Sussex Academy on Thursday, Feb. 7, after Coastal Point press time, in what is also Sennior Night for the Indians. Back on Jan. 3, IR defeated the Seahawks, 40-18. They will close out the season on the road at Milford on Tuesday, Feb. 12. On Jan. 31, it was a fast-paced, back-and-forth high school boys’ basketball game that featured plenty of action — certainly enjoyable for those in attendance. And through three quarters of action, the Indian River and Delmar squads were all locked up at 49-49. Unfortunately for the host Indians, offensive struggles proved to be too much to overcome, resulting in their 72-62 loss to the Wildcats. A trio of seniors led the Indians’ offense, with Jamier Felton scoring a team-high 18 points, while Antonio Jones chipped in with 15 and Michael Meehan added 13 markers. Isiah Kane scored a game-high 19 to lead Delmar, with Trevor Gibson (16 points), Jerome Mitchell (14 points) and Jeremiah Beale (12 points) each contributing double-figure offensive efforts. The Indians — sitting 6-12 overall on the season — were set to close out the 2018-2019 campaign with a game at Sussex Academy on Thursday, Feb. 7, (after Coastal Point press time), before returning home for Senior Night against Milford on Tuesday, Feb. 12. IR defeated Sussex Academy 69-31 the first time the teams met this season, back on Jan. 3.